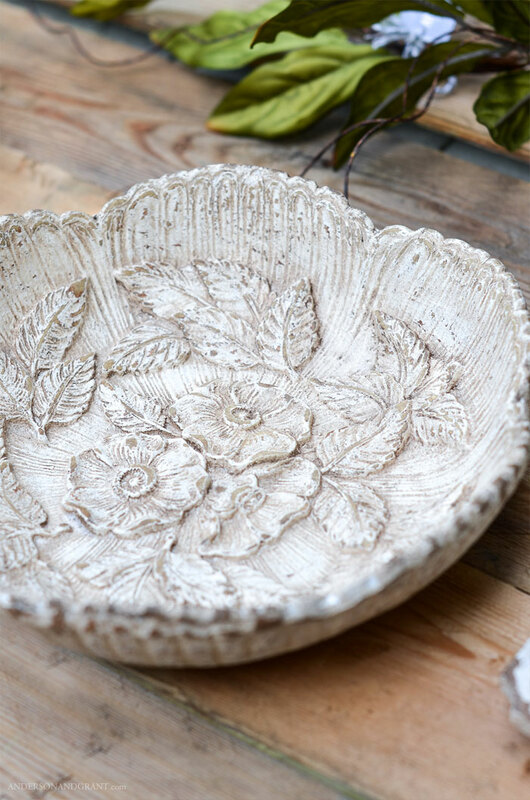 A worn out thrift store bowl is given a distressed farmhouse style makeover. I have a super easy before and after to share with you today! As you may know, I'm all about painting thrift store finds and normally turn to white as my color of choice. But today's technique could be applied to any "carved" item in whatever color fits with your style. There are some metal ceiling tiles or wood candlesticks out there just calling your name. Please know that some of the links in this post are affiliate links. This allows me to make a small commission if you purchase something, but your price will stay the same. I only will share products I believe in and all opinions are my own. You can view my disclosure policy here. Thank you so much for helping to support this blog! 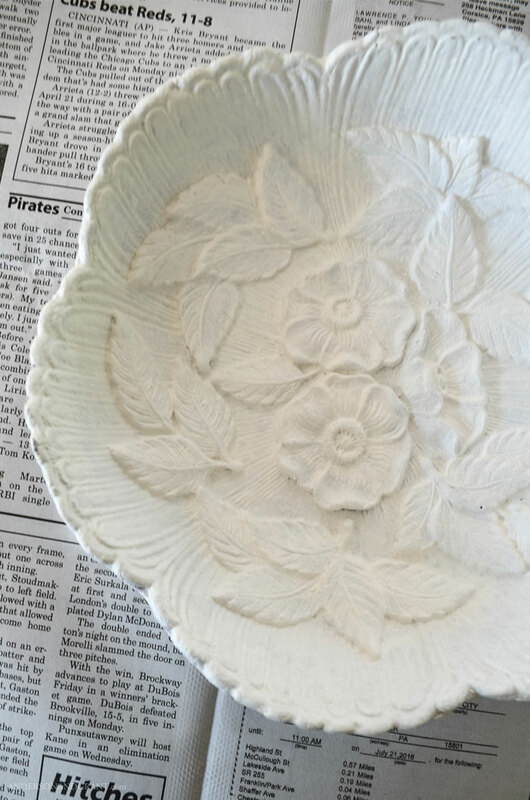 I came across this bowl while at Goodwill and really fell in love with the intricate details of the carved flowers and scalloped edges. Although it looks like it is made of wood, it isn't. I'm not actually sure what material it is made out of. (One of my reader's has let me know that this bowl is made out of a composite of wood pulp and resin by the company Syrocco. Thanks Gracie!) 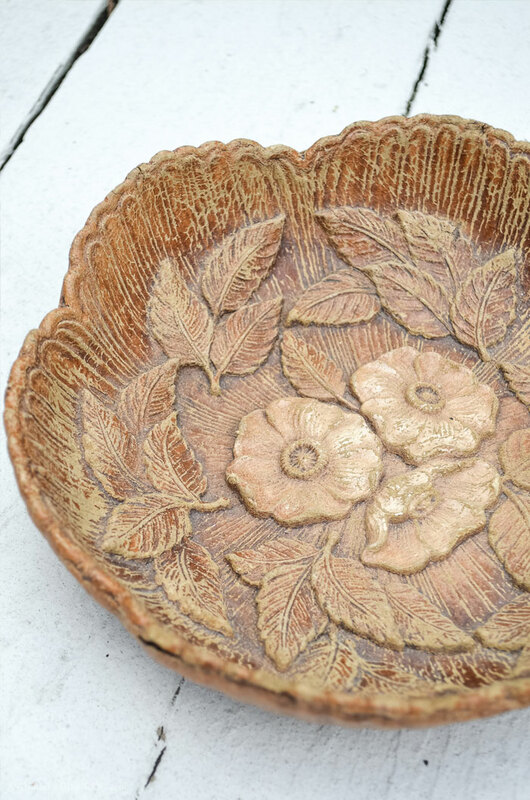 It was very worn, though, and as much as I adored the carving, I wasn't a fan of the orange color of the bowl. Paint was the answer once again. Two coats of white paint (Champlain by Fusion Mineral Paint) freshened up the bowl, but made it look a little boring. 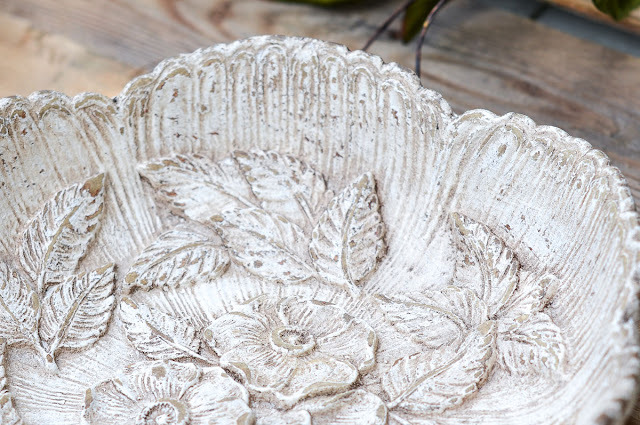 With the beautiful carving, the bowl had character, but the paint seemed to almost mask that. And distressing the edges with sandpaper helped a little, but not enough. I tried giving the bowl an aged look with Miss Mustard Seed's Antiquing Wax and a wax brush, but then it became too dark. It really just looked dirty. So then I rubbed clear wax (again from Miss Mustard Seed) over the entire bowl to lighten the dark wax. 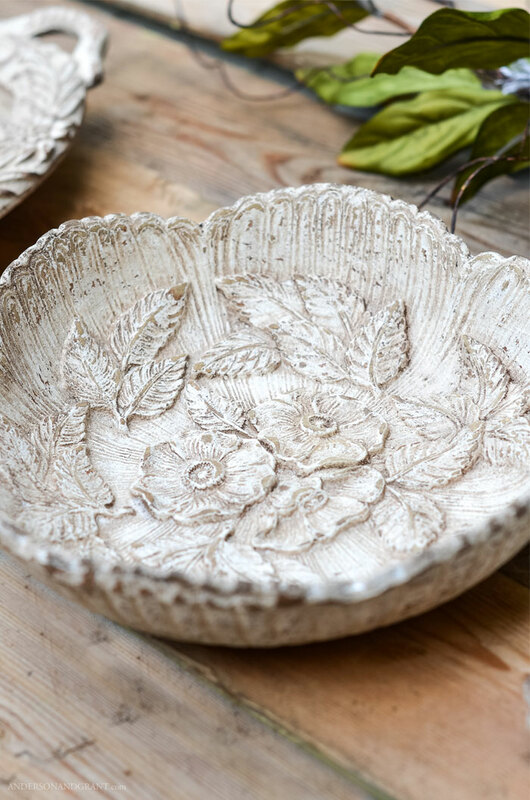 It allowed the darker wax to stay in the cracks and details of the bowl, but allowed more of the white paint to show through. This is a great tip to know anytime that you are using dark wax on something and find the finish to be too dark. It can be evened out and lightened simply by rubbing in some clear wax. I added some additional sanding to the edges of the bowl, flowers, and leaves to make the aging appear to be more natural and was finally happy with how it turned out. And although it took me awhile, most of the time was spent figuring out what I'd try next! My experimenting has saved you the time spent in trial and error. Once the bowl was done, I couldn't have been happier with how it turned out. It is aged in all the right places and really looks like something you might pick up at an antique market. But it only cost me a couple dollars to do. I've said it before, but it bears repeating......Having beautiful things to decorate your home with doesn't have to cost a lot of money or time. Look for those things that have character, but need a little love. Things like color and fabric can always be changed to better suit your style. And your own two hands can create more beauty and charm that a factory in China ever will.